Python is a wonderful high-level programming language that lets us quickly capture data, perform calculations, and even make simple drawings, such as graphs. Several graphical libraries are available for us to use, but we will be focusing on matplotlib in this guide. Matplotlib was created as a plotting tool to rival those found in other software packages, such as MATLAB. Creating 2D graphs to demonstrate mathematical concepts, visualize statistics, or monitor sensor data can be accomplished in just a few lines of code with matplotlib. 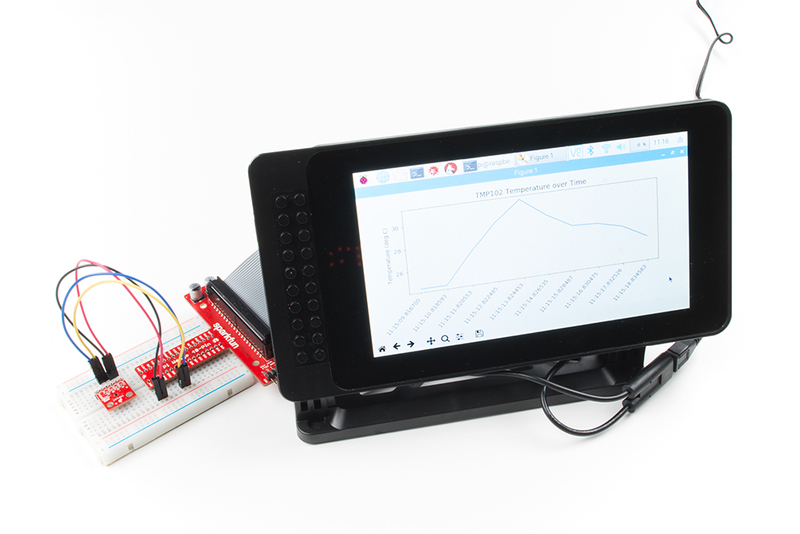 The Raspberry Pi is a great platform for connecting sensors (thanks to the exposed GPIO pins), collecting data via Python, and displaying live plots on a monitor. At the bare minimum, you need a breadboard and some jumper wires to connect the Pi to the TMP102 sensor. However, the Pi Wedge and some M/M jumper wires may make prototyping easier.